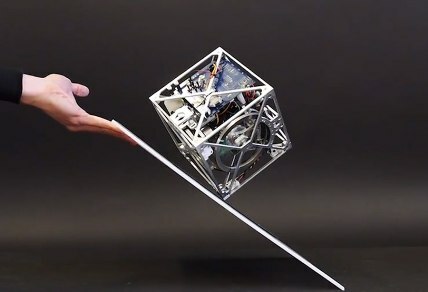 Sometimes engineers developed devices which are full of useful, innovative and unique ideas and sometimes it is imaginative such as Cubli which is not so useful but it is innovative robotic and designed in order to simply balanced on the single point. The Cubli is a 15 x 15 x 15 cm cube which can jump up and balance on its corner. It is designed by the team of researchers at ETH in Zurich and Switzerland. This university is also known for the creating a broad range of dynamic systems which includes juggling machines and an innovative drone that uses electric jets for propulsion. Its name has been derived from the Swiss word for Cube which refers to the Cubli. This robot considers a unique 3D inverted pendulum system that enables the robot in order to jump as well as balance. It functions by rotating wheels at the high speed in order to create angular momentum and forcing the cube up on the edge. It has the reaction wheels which are mounted on three of the faces on the cube. Cubli can change the velocities that allow it to be rotated and tilted in any direction along with the possibility of making it jump. These motor torques an also be used in order to achieve a controlled fall so that the Cubli can be commended for falling in any arbitrary direction. In addition to jump, balance and controlled falling, it can also able to walk.